Keeping you in the game longer by helping you recover faster. Here’s a promotional item that is sure to “heat” up your next marketing campaign! 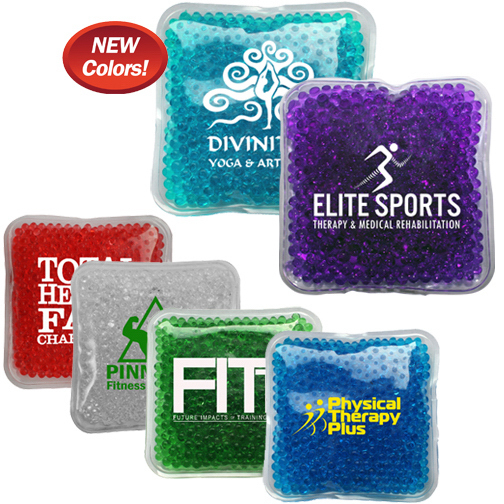 The Gel Bead Hot / Cold Pack can be heated in the microwave or cooled in the freezer. Measuring 4″ x 4″, this product is reusable and non-toxic. The beads keep the pack flexible when cold. An ideal giveaway for athletes or health care events, this item has a large section for imprinting your company name or logo. This item comes in multiple different colors like purple, red, clear, dark blue, green, and light blue. Be sure to order yours today.